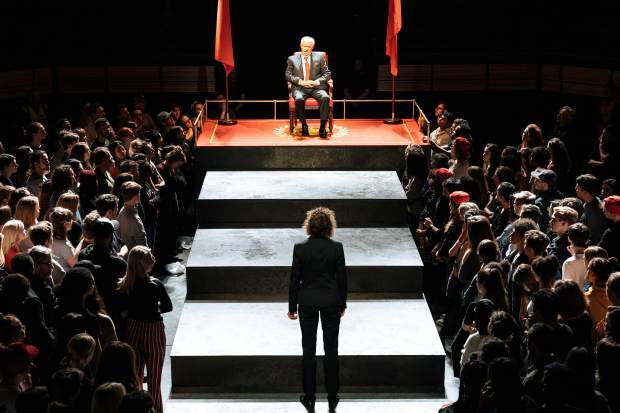 In Nicholas Hytner's production of "Julius Caesar," he thrusts audiences into the street party of Caesar's return, the congress that witnesses his murder, the rally for his funeral and the chaos that blows up in its wake. Coming this week to Sierra Cinemas is a “ferocious, immersive” (Sunday Times) “Julius Caesar” by William Shakespeare. Broadcast live from The Bridge Theatre in London, this latest production from National Theatre Live is directed by Nicholas Hytner and features a star-studded cast. Paired down and fast paced, this modern-dress version of the play runs straight through without intermission. The production has been critically acclaimed for its political relevance, gripping action and unique staging. “Julius Caesar” plays twice at Sierra Cinemas — Thursday at 6:30 p.m. with an encore March 28 at 3:30 p.m.
Caesar returns in triumph to Rome and the people pour out of their homes to celebrate. Alarmed by the autocrat’s popularity, the educated elite conspire to bring him down. After his assassination, civil war erupts on the streets of the capital. “Tremendously gripping. Unfolds like a chic, glossy spy thriller.” — Time Out. “A star-studded political cataclysm for our times.” — Daily Telegraph. National Theatre Live is an initiative by the National Theatre to broadcast live performances onto cinema screens around the world. Since its first season in June 2009, over 1.8 million people have experienced the work of National Theatre Live in 700 cinemas in 25 countries. Tickets for Julius Caesar are $18 for adults and $15 for seniors, students, and children 12 and under. Advance tickets are available now at the Sierra Cinemas box office or online at http://www.sierratheaters.com. Sierra Cinemas is located at 840-C East Main St. at the corner of Hughes Road in Grass Valley.